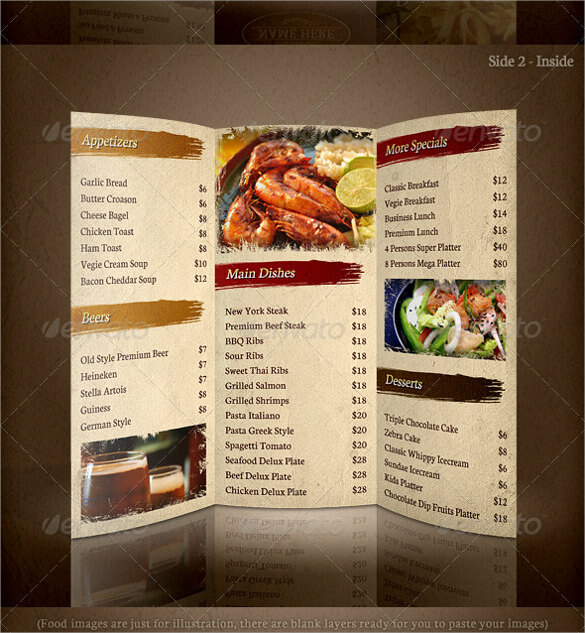 A restaurant brochure template should be attractive with good color combination and catchy words of dishes and cuisines. 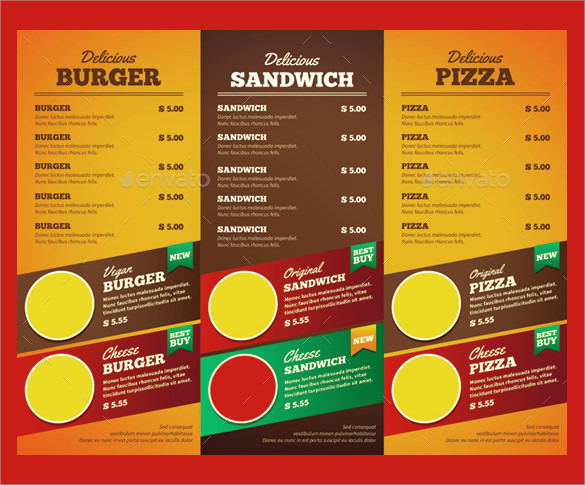 It should be restaurant specific Business Brochure Template and not a copy form other restaurant and should match the theme of the restaurant, if any. It should be in language understandable by everybody. It looks better if it carries picture of a few dishes offered. 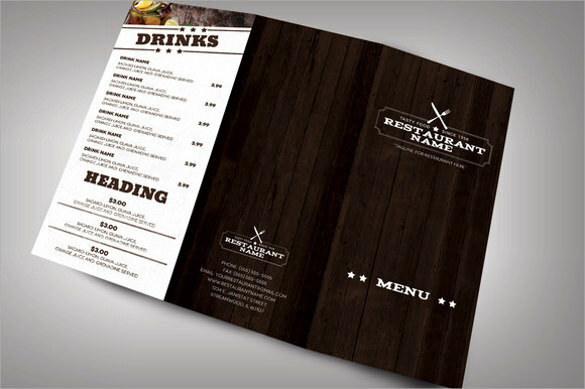 Here we present some of the best templates that can be used for designing a restaurant brochure. 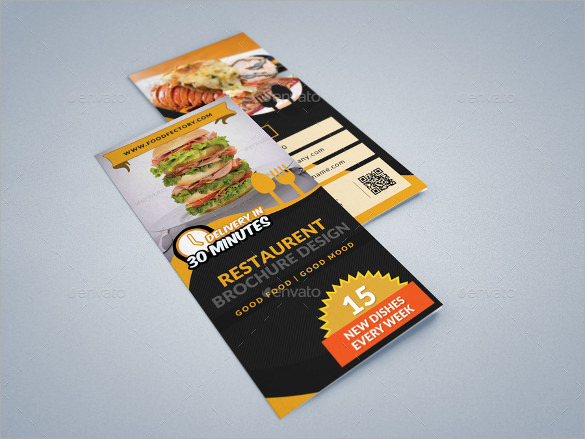 This attractive restaurant brochure template can play a good role in attracting people to a restaurant. 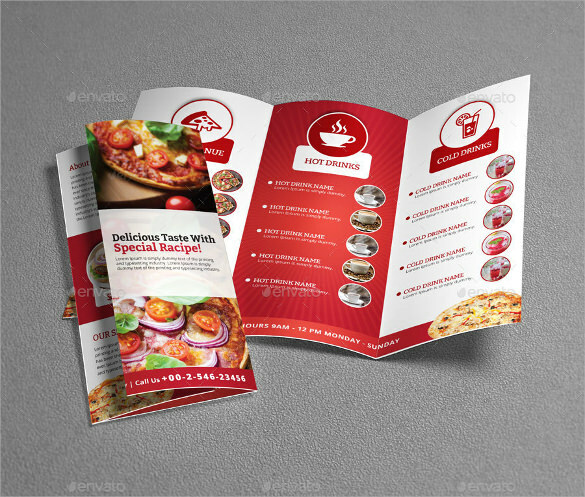 This brochure design tells about what is available in the restaurant and details of all the items offered. Remember, your brochure should not contain any spelling mistake. The color, paper quality etc, should also be attractive. 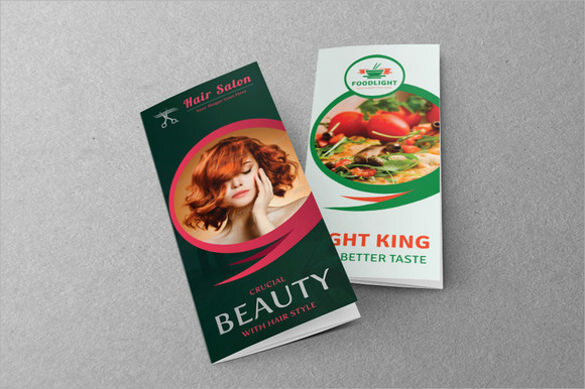 This type of template is designed if you have a number of items available to be offered and you want to give some different look to your brochure. You can make it a two-fold or three fold brochure. 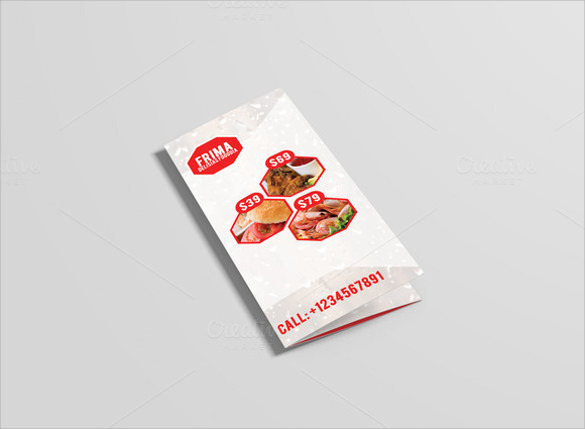 This makes your brochure look different from the rest and lets you give an expression of many food items available. 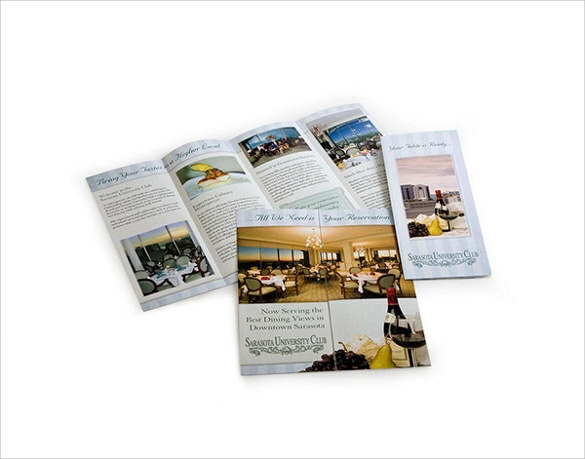 Your brochure speaks for you. 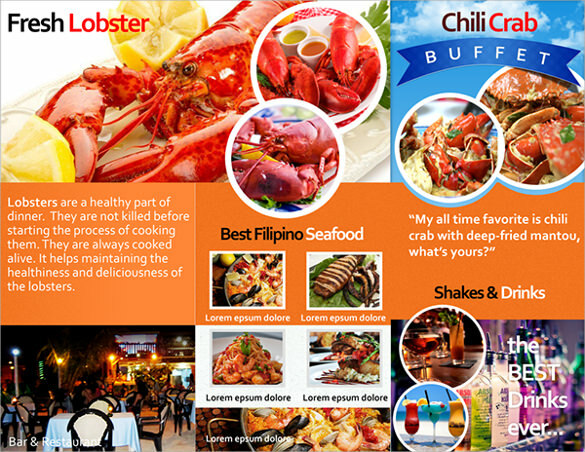 The sea food brochure can highlight the specific cuisine you offer. 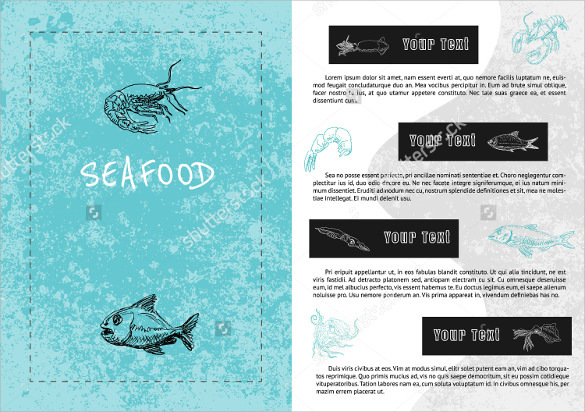 If you are specialized in sea food, this brochure design is attractive and indicative. Moreover, this will bring specific crowd to your restaurant and will save your time form attending uninterested guests. A dull brochure gives a boring impact on the customers. Hence, choose this colorful brochure with a vibrant look. Usethese soothing colors liked by all types of customers and match the spirit of your restaurant truly. 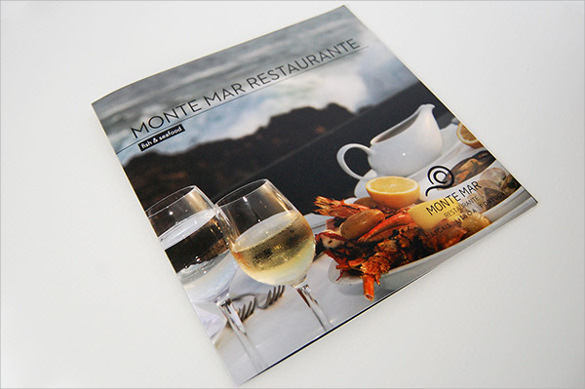 This elegant restaurant brochure is best for restaurants which cater to an elite class of customers. 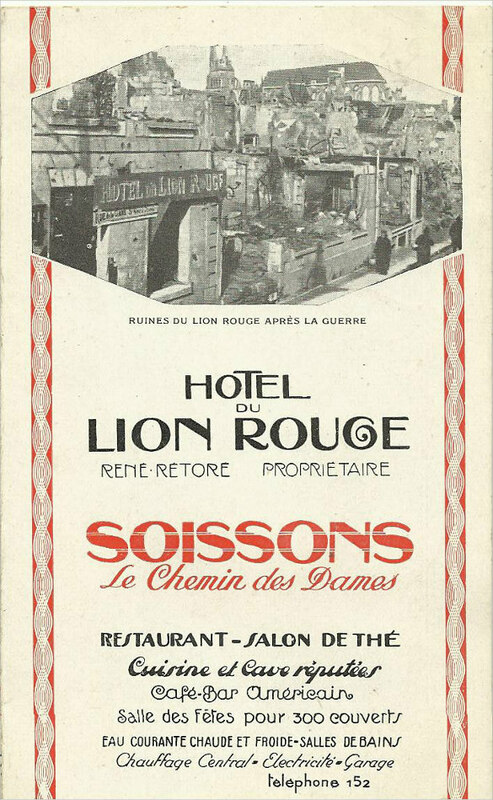 When your elegance is depicted in your brochure, it attracts a premium class of customers for you. This segregation helps you to have a crowd suitable to your restaurant’s image. 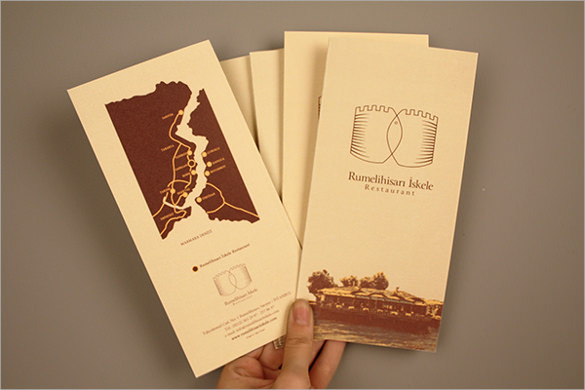 Light Colored Restaurant Brochure could be used if your restaurant is made in ancient palace style or if it is located nearby a tourist place for example if it’s a fort nearby, you can give a picture of the fort in light color, on the brochure to attract people. The people who come to visit the site only, may try your food once they come. 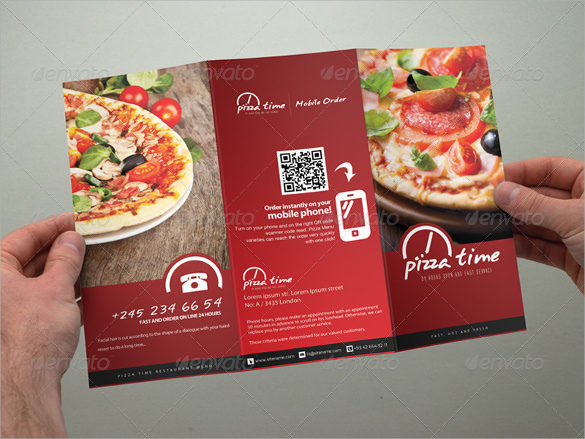 This type of template is designed putting creativity in your brochure like giving pictures of chefs or dishes, so as to attract customers. The majority of the people going to restaurants are young and they prefer creativity over the stereotype brochures and thus such a template will definitely work wonders for you. 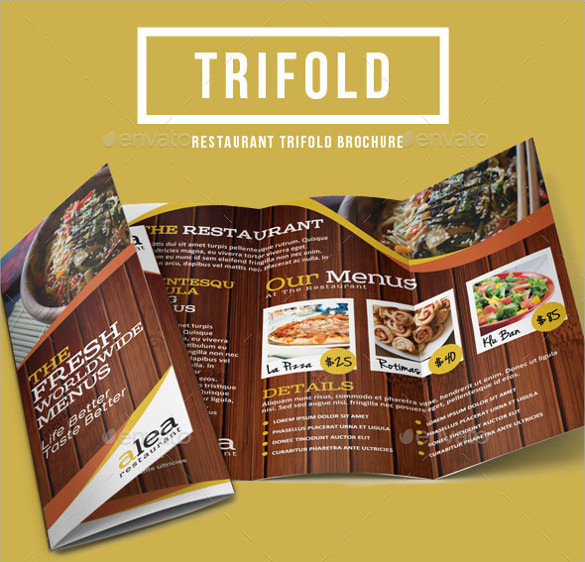 What is a Restaurant Brochure Template? 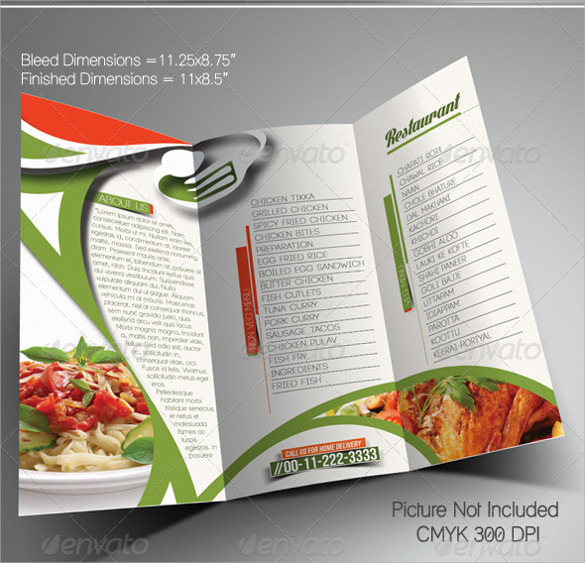 A Restaurant Brochure Template is all about how a restaurant brochure should be made and what all it can cover. 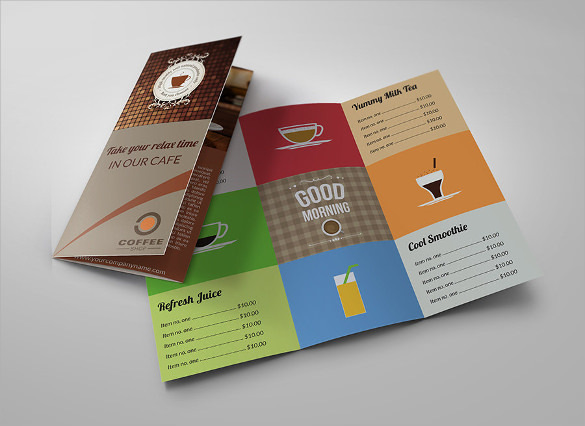 It tells that your brochure can work for you as a sales person; it is your restaurant’s first impression and hence should be remarkable. 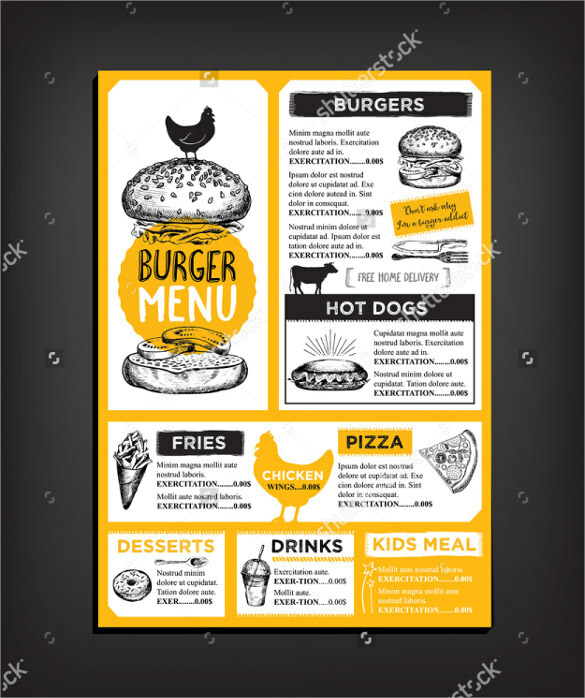 It should carry the image of your restaurant in a positive way.The theme of the restaurant brochure template should not deviate from restaurant’s theme, Sports Brochure Template thus spoiling the guests’ mood. Points which can make you differentiated from others should be covered. 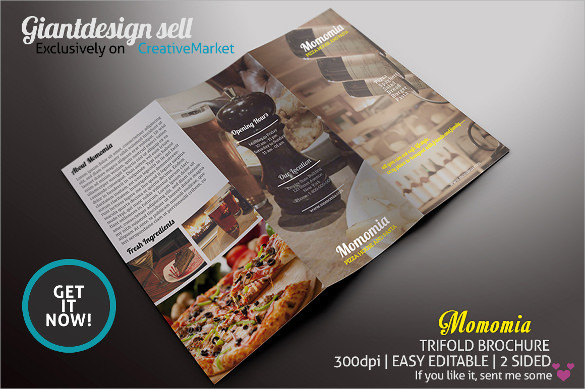 Moreover, the target class of customers should also be taken care of while making a particular brochure template. 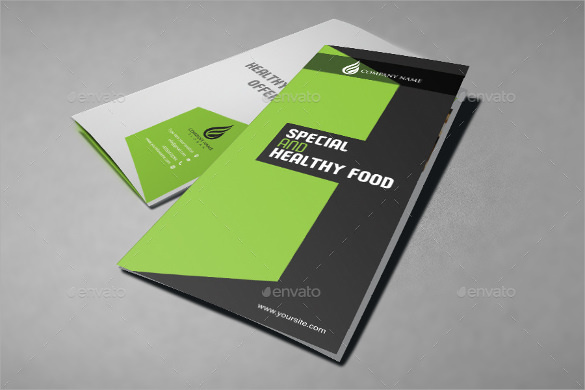 How to Write a Restaurant Brochure Template? 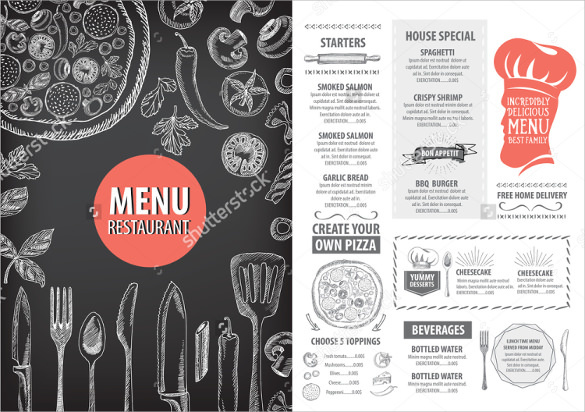 While writing a restaurant brochure template you need to keep in mind all the points that you see in a good brochure and also in a bad brochure. The good points should be the dos and the bad points should be the don’ts. You should also keep in view the number of types of restaurants available in the market and then should talk about how to stand ahead of the line and grab the opportunity. 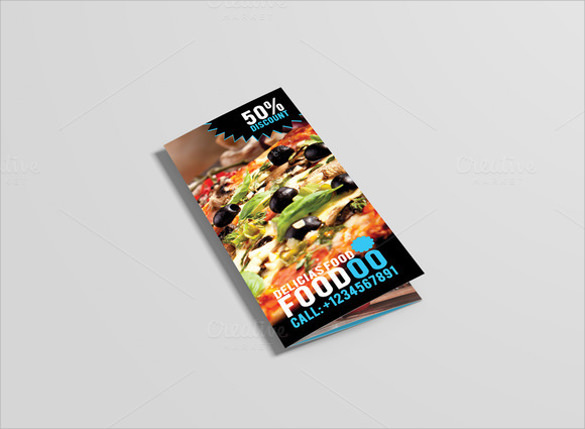 Who are the Benefiters of Restaurant Brochure Template? 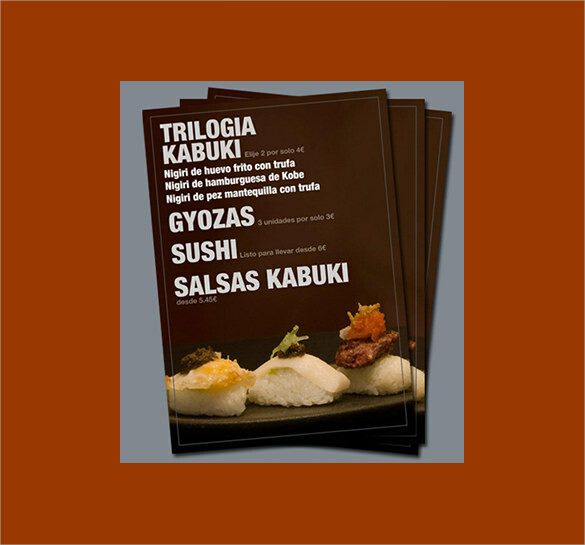 A restaurant brochure when well designed is beneficial for both the owner of the restaurant as well as the customers. The better it will be the more customers will come hence more business for the owner. On the other hand, customers also are benefitted by getting good food at good place. 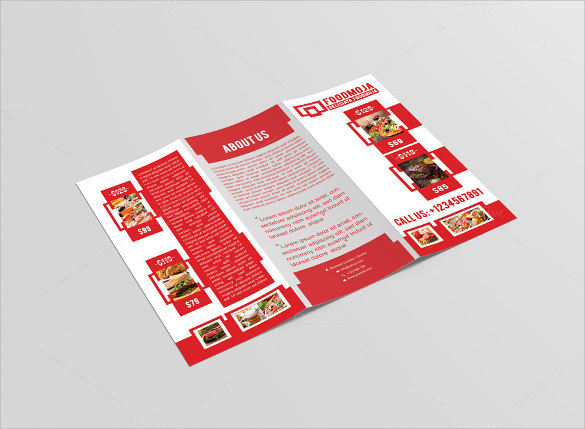 Thus, to sum up, we can say that restaurant brochure template is a mirror to the restaurant and thus should give a clear picture of your offering thus attracting more customers and more business for you.